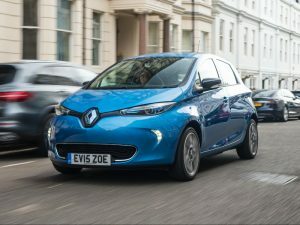 Renault has almost doubled the battery capacity of the ZOE supermini, with range increased to 250 miles on a single charge. The Renault ZOE now offers a range of 250 miles. Unveiled at the Paris Motor Show, the ZOE ‘Q90’ features a 41kWh battery, compared to the 22kWh unit offered since the car launched in 2012. It will replace the rapid charge-compatible version in the UK line-up when sales begin in November. This means only Tesla’s electric vehicles offer a longer range. Fully charged, it will cover 250 miles under NEDC conditions, though Renault claims it will travel around 186 miles in urban use, beaten only by the Opel Ampera-e which won’t be sold in the UK. Comparative figures for the longest-range ZOE sold to date are 149 and 106 miles respectively. Despite the increased capacity, the battery is the same physical size as the 22kWh unit and said to be only slightly heavier. The ZOE’s 90bhp output is unchanged, and it can still rapid charge at 43kW, regaining range, in miles, at the same rate as the version it replaces – it will regain around 50 miles in 30 minutes. Full and 80% charges will take longer, in line with the capacity increase. The battery launch is accompanied by new digital services for the car. The R-Link system will feature a Z.E. Trip function, which will show real-time availability of charging points. Renault is also launching a Z.E. Pass smartphone app to give access to units across Europe. The Z.E. app will be updated to include a door-to-door navigation feature, helping drivers to find their cars once parked and to cover the final parts of the route on foot. The R240 version, which retains the 22kWh battery and offers half the charging rate, will still be available as an entry point to the range, renamed ‘R90’. Prices and trim availability for the updated ZOE will be announced closer to the launch date.